Purpose: In this experiment the effects of dilute hydrochloric acid (HCl) and dilute sodium hydroxide (NaOH) on various acid/base indicators will be explored. Litmus is a water-soluble mixture of several dyes extracted from lichens. Litmus solution is absorbed onto filter paper, and the paper can then be used as an acid/base indicator. Acids turn blue litmus paper red, and bases turn red litmus paper blue. pHydrion paper is filter paper which has been soaked in a mixture of indicator dyes. The dyes absorbed onto the paper are affected by the pH of a solution. 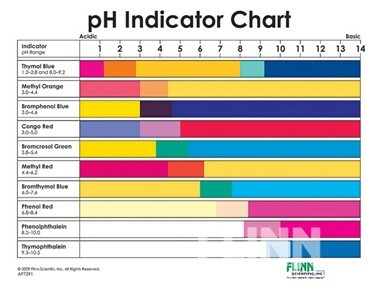 A color comparison chart allows the user to determine the pH of the tested solution. Universal indicator is a synthetic indicator that was developed by Kodak laboratories to create a quick test for pH that anyone could interpret easily. It is a mixture of three other indicators: phenolphthalein, bromcresol green, and methyl orange. Anthocyanins are responsible not only for the red and purplish colors of autumn leaves, but also for similar colors in various leaves (red cabbage, red lettuce, red plum trees), flowers (roses, hydrangeas, geraniums), roots (beets, radishes), bulbs (red onions), and petioles (rhubarb). Anthocyanins are water-soluble and can easily be dissolved from the plant sap. The color of anthocyanin depends on acidity, and thus it may serve as a pH indicator. Bromothymol blue is a chemical indicator for weak acids and bases. Bromothymol blue is mostly used in measuring substances that would have relatively low acidic or basic levels (near a neutral pH). It is often used in managing the pH of pools and fish tanks, and for measuring the presence of carbonic acid in a liquid. Materials: Hydrochloric acid, sodium chloride, phenolphthalein, thymolphthalein, phenol red, bromoresol blue, bromothymol blue, universal indicator, litmus paper, sheet protector. Procedure: 1. Label each space on the chart below with an indicator. 2. Place a drop of each indicator in its specific cell on the chart. 3. Add a drop of hydrochloric acid on the drops in the left column. 4. Add a drop of sodium chloride on the drops in the right column. Discussion: The various indicators that we used are useful in various situations, as seen in the chart below. The phenolphthalein and thymolphthalein would be used to indicate bases. The phenol red is mostly used to test for bases right around neutral. Bromothymol blue is used to test acids and bases right around neutral. Bromoresol green is used to test acids right around neutral. Universal indicator is made up of various indicators, which gives it a very large range. The litmus paper determines if a substance is an acid or a base, but it does not tell us the substance’s pH.